2014 Day 28: Field Trip! Single graphic without details hardly covers the whole story. most of those kids killed with a firearm are victims of homicide. Most of the homicides are results of gang/drug activity. In 2010, 0-17 total of 1,337 firearm related deaths. Given that 50% of all homicides are related to drug and/or gang activity per the F.B.I. — shouldn’t that be the focus instead of the tool used? Exactly, suicides should prompt more gun safety and depression awareness, not gun control. If a teen was to commit suicide, there are plenty of tall buildings, highways, and drugs. The gun shouldn’t be blamed as the cause in a suicide. 3boxesofbs, the tool used is highly important as well as the circumstances because of its capacity to end life. 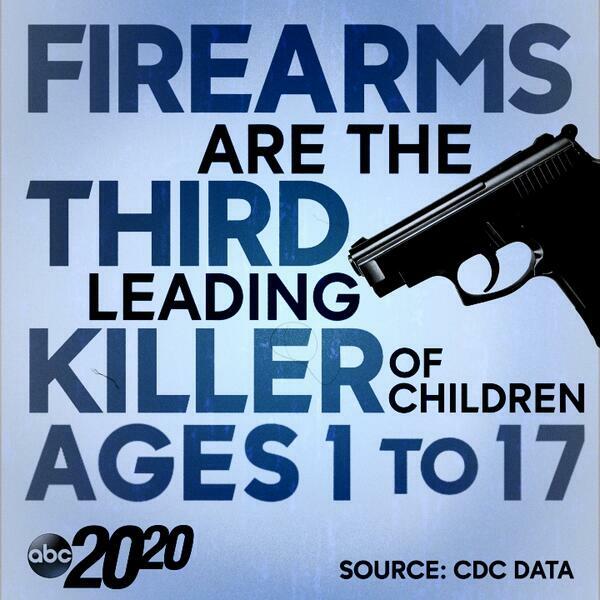 The graphic I posted simply states the fact that it is the third leading cause of death among young people. I find that unacceptable and so do most decent humans who care about the future of young people. Plamya, I think that the value of awareness is highly debatable. A lot of people are aware of how to safely store their firearms, but they don’t do it. Please understand I deeply care about the future of young people. Even old people and not so old people. Capacity to end life? EVERYTHING has that. Drink too much water (essential for life) and it can kill you. Cain killed Abel with a Rock – that is how old items with ‘capacity to end life’ are. What I’m suggesting is we focus not on the tool but the people using the tool. You drive, I doubt you drive and I highly doubt you’ve driven drunk and killed someone. So does it make sense to put an alcohol interlock on your car because some one else had a problem? Nor does it take into consideration the millions of peaceful uses of firearms each year. Heck the National Crime Victim Survey found an estimated 108,000 defensive gun uses per year. Kleck and Gertz survey found up to 2.5 MILLION. Should we ignore the good that comes out of firearms because of the bad? Playma’s point seems to be people will find a way to commit suicide. Japan, with ultra strict gun control laws and virtually no legal ownership, has a suicide rate that makes ours look miniscule. People will find a way. We need to focus on the depression and getting people treatment instead of stopping them from getting guns. I’ll tell you what. When drinking too much water, driving drunk and/or rocks become the third leading cause of death for kids 1-17, I’ll post that graphic.